Masoud Behnoud English Version: What Happens When the News is Locked Up in a Cell? What Happens When the News is Locked Up in a Cell? Scattered around a sad, walled-in garden, with a few dusty and thirsty trees, broken pieces of rudimentary equipment for physical exercise lie around although no one is in any mood to exercise or body building here. The air in Iran’s Tehran is so polluted these days that it is hard to breathe without a face mask. This is a corner of the notorious Evin prison in north Tehran. Over the past few weeks, Evin has been receiving new residents at all hours, day and night. And, with the resulting shortage of space, the terrified new arrivals have to sleep in the corridors. In the sad, walled-in garden of Evin's Ward 935, the 200 prisoners shuffle around - for two hours a day - to expose their eyes to a bit of natural light. They are not allowed to talk to each other to exchange their scraps of news; scraps that amount to little more than speculation and guesses, because their contact with the rest of the world has been completely severed and they are not allowed any visits or telephone calls. Until just 35 years ago, what is now Evin prison was a beautiful garden built by a former prime minister, who was using it to breed rabbits. But, then, the garden was handed over - on the Shah's orders - to SAVAK, the notorious security and intelligence service, to allow the construction of a modern prison with individual cells. Iran's last king, who was happy to be seen by the world as the absolute ruler of Iran and the top man in the region, ordered the construction of Evin prison so it could be used to lock up "the dozen or so terrorists and saboteurs". Even in the last days of his reign, the Shah kept insisting that his opponents had orders from abroad to disturb the country's peace. But it became clear 30 years ago that there had been millions - not a dozen or so - discontented people in Iran; people who both forced the Shah to flee the country and freed thousands of political prisoners. More recently, Mahmoud Ahmadinejad, who, in the opinion of his opponents, has held on to the presidency by rigging the June 12 election, described Iranian freedom advocates and activists as "a few bits of dirt and dust". But, in just the past month alone, several thousand protestors have been detained, joining the 3,000 prisoners who were already in Evin. And on 15 June, two million people marched through the streets of central Tehran. In their chants, addressed to Ahmadinejad, they cried: "You're the one who is dirt and dust, you're the one who is the enemy of this land", "Tell us the real election results, you liar". As it became clear that the declared election results had sparked extensive protests in Iran, Ahmadinejad’s government, his hardline supporters and the proponents of violence showed that they had no intention of accepting people's demands. They arrested young people and university students, handcuffed them and took them to unknown locations. This is in circumstances in which the Constitution of the Islamic Republic of Iran says that people are free to hold peaceful demonstrations as long as they are not anti-religious. But the government has been dispersing demonstrators with tear gas, electric batons and clubs. The government has said that seventeen people have been killed in the streets of Tehran in the course of the protests. But word has it that the number is much higher than this, especially in far-flung towns. It is said that a special section of Evin prison, where a small studio has been constructed, has the task of providing propaganda material for the hardline groups' media: the confessions of people who are being held in solitary confinement. Audio- and video-recording equipment and hidden cameras have been installed in this section of the prison. The aim is to tell the public exactly what the Shah's government used to tell them, which is that people's peaceful protests against election rigging is "a velvet revolution" commandered by foreign governments. Prisoners are being forced to make confessions, but, the moment they can say otherwise, they will explain that the confessions were extracted forcibly and against their will. Among the thousands of people who have been arrested by the security forces and Ahmadinejad's supporters, there is a group of about one hundred, who have a special status. Their crime is that they are journalists. The government is angry that reporters filmed the peaceful protests and the violent way in which they were suppressed; thereby allowing the world to learn about the fate of "a few bits of dirt and dust" in Iran. The government has used money, which it should have used to improve people's living standards to buy expensive equipment for blocking websites, jamming satellite channels, and cutting off mobile phones and SMS communications (cellphone text messaging), so that it can dump whatever news it wants on people and keep them ignorant about many developments. It goes without saying that such a government sees journalists as its number one enemy. The detained reporters, journalists and bloggers harmed the government because they foiled all the government's efforts to keep people in the dark. This is why the detained reporters' situation is different from that of all the other detainees. Reporters have to confess that they ecnuaged or forced university students, women's rights activists and the other "bits of dirt and dust" come out into the streets. They have to confess that, through their actions, they made people take part in demonstrations instead of going to work or to their classes; they made them insult the very popular government; and they made them accuse it of tampering with the election results. Reporters have to confess that they were spies and that they reported on events on the orders of foreign powers' intelligence organizations. But these one hundred detainees are the people who kept the world informed about what was actually happening in Iran. They did their professional duty as journalists everywhere in the world are expected to do. After several weeks of detention and round-the-clock interrogations, the government disseminated two so-called confessions. The first was that of a young journalist Amir Hossein Mahdavi. In order for state-affiliated media to make his confessions appear serious, they described him as one of the main members of a political opposition group. And they cited him as saying that the groups which are criticizing Ahmadinejad's government have links to foreign governments and were trying to create chaos in the country. Another person whose purported confessions were reported by state media was Maziar Bahari, a reporter for Newsweek magazine who is also an Iranian affairs analyst, a documentary filmmaker, and the editor of interesting books about Iran in English and German. He has also worked for reputable international TV stations, such as Britain's Channel 4 and Al-Jazeera. 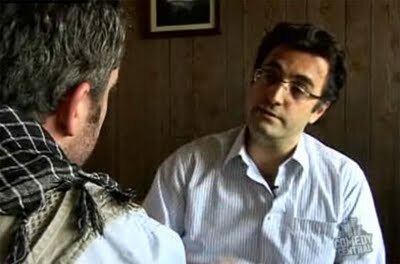 Maziar Bahari is one of the best-known Iranian journalists among the foreign media. And, over the past three years, he has produced dozens of documentary films from Africa, the Middle East and West Asia which are all shining examples of professional work, unbiased reporting and a sense of responsibility. It is precisely because of his experience and record that many religious scholars, diplomats, thinkers and politicians (including many supporters of the Islamic Republic) have divulged their views in interviews with him. Maziar, who had just completed a documentary film about injustices against people in Southeast Asia, was in Iran at the time of the presidential election. He was there because it was the right place to be for news. Many of the world's most reputable reporters had also headed for Iran to cover the election. Of course, Iran is also Maziar's home country. And, now, he has been a prisoner in Evin Prison for three weeks. He is again in a place that is full of stories to tell and scenes to film. Many of the world's journalists would pay a high price to speak to the freedom-loving young Iranians who are fighting a bullying, dictatorial state, and to interview them in their condition as prisoners. Many of the world's distinguished journalists have been making repeated attempts to receive the authorization to go to Tehran to cover the most exciting movement that the world has seen in recent years. But Maziar Bahari is deprived of the opportunity to cover this story. Although Maziar Bahari, a hard-working professional journalist, is in the closest location possible to cover the green movement of Iran, he can only hear muffled sounds. For the crime of tying a green band around their wrists, taking part in peaceful civil protests and crying out, "What happened to our votes? ", young men and women, artists, sportsmen and even elderly women first had to endure beatings with clubs and electric batons, and then to be tossed into the back of a van like a sack of potatoes and taken to Tehran's notorious prison. These detainees know thousands of songs and poems, all of which are about love and friendship and shunning violence. Maziar can hear them but he cannot record any of it. He has no recording equipment. Maziar’s prison cell measures one meter by one and a half meters. He is alone. There is no paper or pen, never mind about a camera and the laptop that he used to produce his films and interviews. These were all taken away from him when he was arrested and who knows if he will ever get them back. But what could be worse for a journalist than to hear something being shouted from rooftops throughout a city every night and not know what the shouting is for? But, in all earnest, what does it mean when a single cry can be heard throughout a city every night, so that you can even hear it being voiced in the cell next to yours - even though the prison guards have forbidden any talking and signalling? Iran is pregnant with events. Maziar Bahari is in prison, along with well-known journalists who used to work for the now-banned newspapers in Iran, because the state wants to prevent the world from hearing the cry of the Iranian people's peaceful movement. And the best way to do this, as far as Iranian officials are concerned, is to jail journalists like Maziar Bahari, who wrote in his articles and analyses just a few weeks ago that Iran is in the transitional stage to democracy and that it is ahead of many other Middle Eastern countries in this respect. He said that the Iranian state was much more tolerant than many of the other regional states. But now he has been put in a solitary confinement cell to make the "confessions" that foreign governments had a hand in Iran's reform movement. He has to "confess" that the movement of peaceful young Iranians is bad. He has to come up with an explanation that will convince Iranians that bullets are good, tear gas is good, banning newspapers is good, prison is good. Maziar has to confess these things with longing and sorrow. And in his heart he has to write a sentence that he wrote years ago about an African country: "They may not even realize what the cure for their ailments is, but their eyes say 'freedom'." Even if they are forced to "confess" something else, Maziar Bahari and all the other journalists who are in prison in Iran and elsewhere believe only one thing: Freedom of expression is the cure to backwardness in human societies. Freedom of expression insures societies against corruption and putrefaction. Freedom of expression is a garden, for the greenness and lushness of which many people have lost their lives over the course of history. It is a crying shame that, at a time when a generation of Iranians is crying, "freedom", the people who should be conveying this cry to the world are themselves in prison.